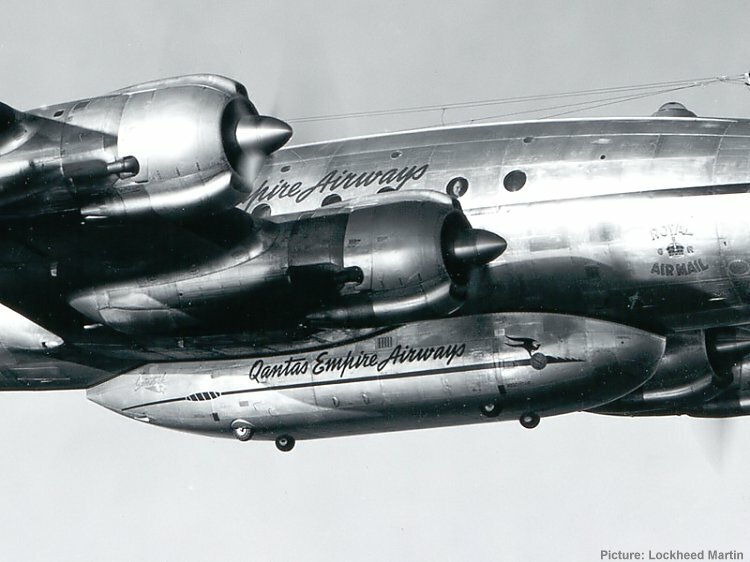 It could be argued that the design brief for the Constellation was - "Compromise on the side of loveliness". 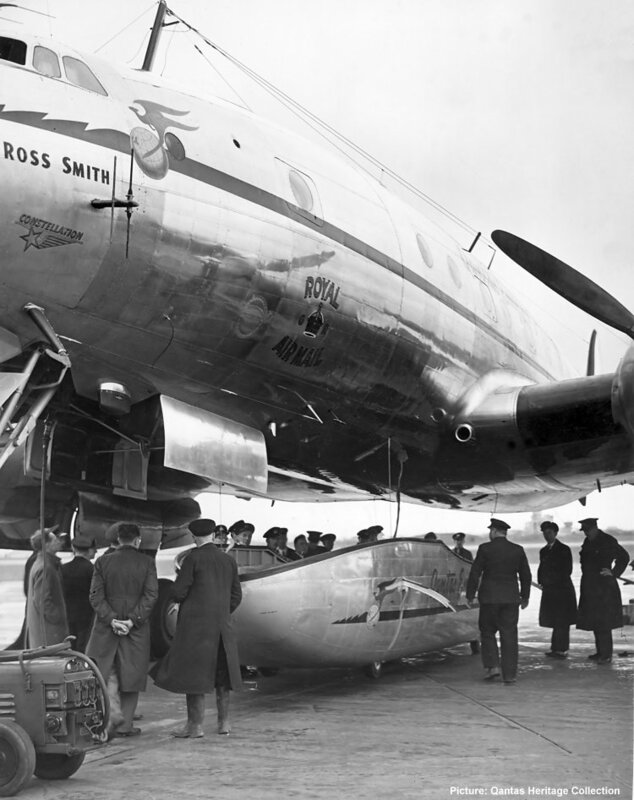 Regardless of the design philosophy, it soon emerged that the aeroplane was often capable of lifting more cargo than could be physically accommodated within the holds of its elegantly curved fuselage. The solution to this wasted performance potential was the so-called Speedpak. 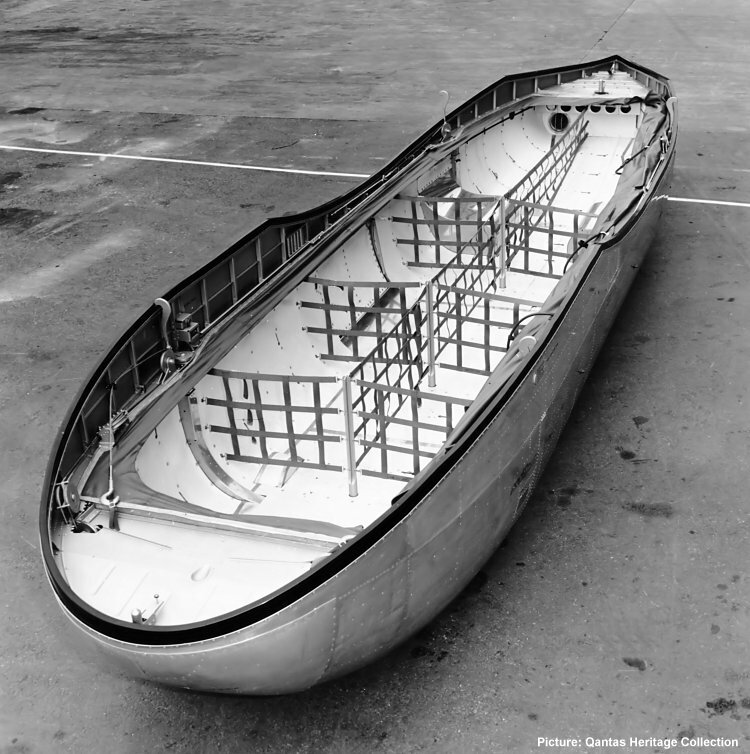 The Speedpak was an external freight pannier contoured to fit under the belly of the Constellation. The Speedpak was never required on the Super Constellation because its lengthened fuselage provided increased hold capacity while the increased structural weight limited any potential additional payload anyway. This view of an empty Speedpak clearly shows the seven netted compartments and the attaching hooks. The following description of the Speedpak is extracted from Peter J. Marson's The Lockheed Constellation Series published in 1982 by Air-Britain Historians and acknowledged with thanks. The Speedpak, developed by Lockheed Engineers at the behest of Eastern Air Lines, was first tested on a Model 049 Constellation (42-94558, c/n 1979). The Speedpak, carried under the fuselage and closely fitting the fuselage contours, is 33 feet 4 inches long, 7 feet wide and 3 feet deep, with an overall height when standing on the ground of 4 feet 6 inches and weighing 1,836 pounds. The payload of the Speedpak is 395 cubic feet and up to 8,200 pounds of freight can be carried inside its seven compartments. A built-in electric hoist lowers the Speedpak to the ground for loading or unloading. For ease of movement on the ground, two semi-recessed wheels are mounted underneath at each end of the container. In spite of its size and weight, the Speedpak reduces speed only by about 10 mph and range by about 4%. The Speedpak was designed to enable a full load of passengers and a large amount of cargo to be carried over the shorter stage-lengths (or up to 2,200 miles with the later 749A) and enabled the useful load of the Constellation to be increased considerably with the new BD-1 engines. Eastern Air Lines and KLM both ordered Speedpaks (14 and 7 respectively) in late 1946, and several other airlines followed suit later. The four Speedpak attachment points (stressed to 2.5g) were incorporated in Constellations on the production line from c/n 049-2076 onwards, and on all 649 and subsequent standard Constellations. A total of 75 Speedpaks was built. The Speedpak aloft on VH-EAB Lawrence Hargrave during pre-delivery test flying. The four ground handling wheels are well illustrated in this view. The Speedpak on VH-EAA Ross Smith lowered for loading/unloading.